Connect colored pigs in this fast-paced, addictive puzzle game. At first glance Tweens HD may look something like an average Bejeweled knockoff but do not be fooled. Yes, it is about matching colorful objects, in this case pigs, but how one does it is pretty unique. Combine that with a breakneck pace and Tweens HD emerges as a fun and incredibly addictive puzzle game. 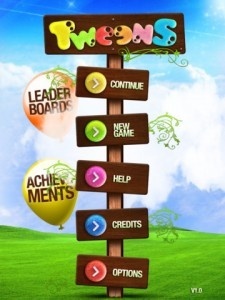 If games like Bejeweled are match-three puzzle games then Tweens HD is a match-two puzzle game. The goal is to match each pig with one of its twins, or “tweens,” of the same color. If they are next to each other then it’s a simple matter of tapping them both and making them disappear. If they are farther away though, players must make sure that there is an open path between the tweens otherwise they will never be reunited. The longer the path the higher the score one can share with the world. The formula is simple and easy to grasp. Then players will realize that in order to clear the board in time they will need to be matching pigs as fast as possible as this is not a patient game. Because the core gameplay so simple, it is less about thinking and searching for connections and more about quickly and instinctively recognizing them. Only on a responsive multi-touch screen could the game get away with this kind of speed as one must move their fingers to match pigs faster than a mouse or buttons ever could. Tearing through stages at this pace is a very satisfying experience and since stages are so short, it’s easy to say “just one more” before players hooked on Tweens HD will realize that their free time has melted away. Adding some variety to these relentless puzzle sessions are special stages, where players must rapidly clear a whole board of pigs of the same color, and a few power-ups. Bombs can save players in a pinch while skillful play can freeze the countdown or turn all pigs into the same color making matches even easier. Later stages place obstacles in the way like rocks or sheep and if a pig finds themself trapped, players can hold down to boost them across the map. The power-up is nice in theory but it halts the pace which is the game’s greatest strength. Luckily it is rarely used. The colorful cartoon graphics are pleasant but nothing to get excited about as is the music. One funny side-effect of the speed though is that players will constantly be bombarded with pig noises making the already strange, high-velocity experience all the more surreal. This effect is amplified if one chooses to mute the music. If anything, Tweens HD might be a little too easy. However, annihilating its stages as quickly as possible is empowering to a degree not too often felt in puzzle games. Anyone looking for a more caffeinated brain teaser should check it out.